Start your engine with the push of a button from up to a 1/2 mile away with this slender, elegant 5 button remote control. Based on the best-selling 2-Way LED Remote Start System, this is the value-priced 1-Way version. Includes the very latest in Remote Start technology, including Virtual Tach, D2D and XPRESSPORT™. SuperCode is the technology that defines the functionality of the Responder LE and the intelligence that drives its advanced features. Its protocol encompasses software-based system signal encryption (replacing hardware-based Clone Safe Code-Hopping). Multi-car operation is designed into the SuperCode protocol, so users will have all of the possible operations for two cars controllable by one remote. 2-way confirmations and notifications of many different events and commands have been designed into SuperCode, so all SuperCode-enabled 2-way systems can tell the user more about their vehicle than any other system on the market. 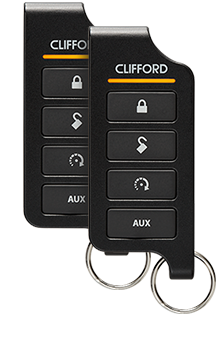 No effort has been spared by the Clifford development team to create the ultimate color keychain remote control, operating Python's top-of-the-line, one-mile range 2-Way vehicle security and remote start system. The result is Python Responder HD, winner of the coveted CES 2009 Innovations Award. Responder HD features Clifford's most advanced color remote, operating a one-mile range, 2-Way security and remote start system with an upgraded user interface, mini-USB charging port and patented menu wheel.